We are proud to be sought after for joinery, we use the best quality timber and offer you excellence, style and longevity for your home fittings and fixtures. If you are looking for joinery for your home we produce whatever you need, from conservatories and porches to radiator covers and interior doors; individually designed to suit every home and budget. 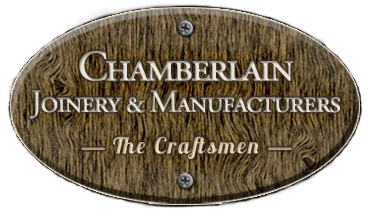 Chamberlain Joinery are the producers of fine staircases, windows, doors, conservatories and more, all made to measure by our skilled carpenters. Our service includes the design, planning and installation stages, with your own requirements firmly in mind and with excellent attention to detail assured by the professionals in our workshop. As all our technicians are experts in their trade, whether you want standard or made to measure, we are confident in the quality and durability of the product. That’s why we we offer a 5 year guarantee on all our work. Our team are all friendly, customer focused and happy to help you get the best from your joinery; we abide by health and safety regulations and will treat your home with respect as we work. Each project is carefully managed to ensure work is finished on time and within budget, and we will ensure effective communication with you throughout the job. Call us now for chat and we can discuss your joinery requirements. We can of course offer a quote free of charge and with no obligation, so get in touch and you could benefit from the skill and experience we bring to joinery in Birmingham, Solihull and further afield.